After experimenting with some of the newer finishing materials and paints, none have really given me the satisfaction of a good, old-fashioned Silkspan and dope finish. Dope, however, is a relatively high cost option, both for nitrate and for butyrate. There is a way to help bring down the expense by buying it by the gallon, if you don't already do so. 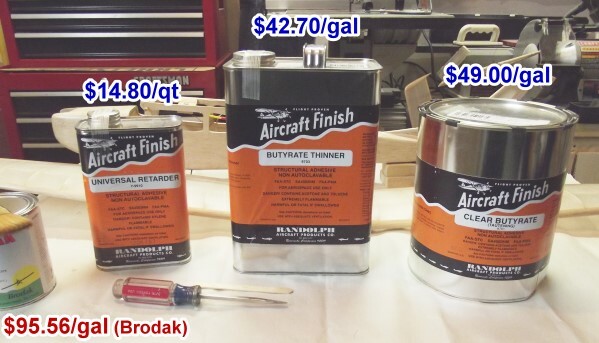 Sig and Brodak are fine dope products, but even in the quart size cans it costs 2x to 3x the amount of getting it by the gallon from Aircraft Spruce. I have a vintage Carl Goldberg 1/2A Skylane configured for control line that is now in the process of being covered, and a vintage control line Sterling F4U-1 Corsair is nearing completion of the construction so it will be getting covered soon. On top of that, I have a vintage Top Flite P-40 Warhawk control line kit that will be next in line for building and covering. Finally, plans and balsa have been procured for a long-awaited control line Douglas DC-3 control line model that will also be covered with Silkspan and dope. That's a lot of dope to buy. Naturally, I want to save money wherever possible, so buying in gallon quantities makes sense. 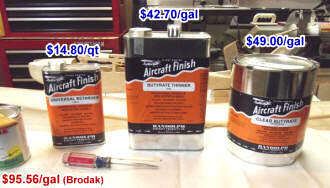 For example (see photo below), a gallon of butyrate clear dope costs $49.00 by the gallon from Aircraft Spruce. The largest can of clear that Brodak sells is a quart, for $23.89 (Crystal Clear is $32.99/gal., but is not equivalent to the Randolph product). That works out to $95.56 per gallon (95% more). Fortunately, Aircraft Spruce also sells white butyrate dope by the gallon for $76.25. Brodak only sells color (including white) in 16 ounce cans at $16.49. that works out to $131.92 per gallon (73% more). Butyrate thinner from Aircraft Spruce costs $42.70 per gallon. Thinner from Brodak is costs $18.19 per quart. That works out to $72.76 per gallon (70% more). So, as you can see, an overall cost saving of 75-80% can be realized when buying it by the gallon. The best bet for buying color other than white is still through Brodak or Sig, because it is $60-$85 per quart from Aircraft Spruce. Here is the insane thing: Buying it buy the gallon costs LESS at $55-$75 per gallon. Go figure. If you need enough colored dope to buy it by the gallon, then it's a great deal. Here is a tutorial I did on covering with Silkspan and dope. It include a few videos of the process.